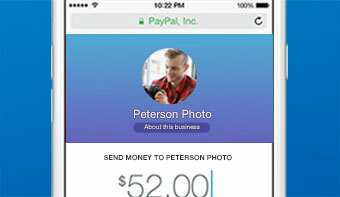 PayPal.Me is the fast, easy way to get paid by your customers, anytime, anywhere. Just send them your personalized link, and they send you money. * It’s that simple. Already have a PayPal.Me page? Log in here. Get your link before it’s gone. 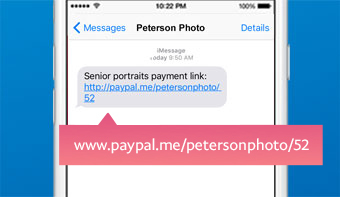 PayPal.Me links are available on a first-come, first-serve basis, so be sure to get a personalized link for your business today. Setting up your custom link is fast, easy and free. 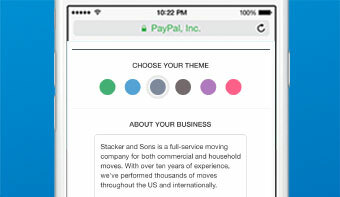 Sign up for a business account, choose your theme and add your logo. Add it to your website or share via social channels, email, or text. Specify an amount to be paid by simply adding the amount to the end of your link. Forget waiting for a check to clear - the money shows up in your PayPal account shortly after it's sent. Why should you get your own PayPal.Me link for your business? A simple and reliable solution to start getting paid. No set-up fees or hidden charges. Standard 2.9% + $0.30 per transaction applies. Access to help quickly, 7 days a week, from a real person. Get paid internationally by customers in these countries. Customers with a PayPal account have the flexibility to pay how they want – credit or debit card or PayPal balance. PayPal purchase protection available for transactions for goods or services. See what’s covered. Get the ability to itemize charges, send batch reminders for unpaid invoices, and track invoices in your PayPal business account. Grab your PayPal.Me link today. The easier way to get paid by your PayPal customers - anytime, anywhere.